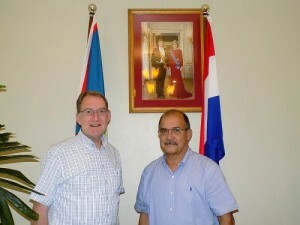 ST. EUSTATIUS - The Dutch-Government-appointed Committee of Wise Men consisting of Council of State member Jan Franssen and former Governor of Aruba Fredis Refunjol visited St. Eustatius for a week to speak with various persons to find a way forward from the current stalemate that exists between the Dutch Government and the Island Government. Speaking at the end of their visit, Franssen said they were requested by caretaker Minister of Home Affairs and Kingdom Relations Ronald Plasterk to find a way to possibly restore the broken relations between Statia and the Netherlands. “That is why we have been here on the island for one week,” he said. Before publishing the report, which is due October 1, the wise men will engage in talks with quite a few persons in The Hague next month. Talks are scheduled with the Committee for Financial Supervision CFT, with representatives of the various Ministries and others to make the puzzle complete. In September, the wise men will return to Statia for some additional talks to make their proposals as complete as possible, and to create conditions that would make it possible to implement those proposals. “It is too early to say what we have discussed and to clarify all the information we have received, as we have to absorb what has being said first,” said Franssen. The wise men said the local Government would not meet with them. They said they had tried several different routes to try to speak with the Commissioners or the ruling parties, but they were ultimately rebuked. Their hope, however, is for everyone on the island to try to work with each other in finding the right way to help Statia. “It is a small island. Everyone needs to work together to bring the island forward and do their utmost for the best interest of their country. There is a broad common understanding that the situation with the Netherlands cannot last, that things must change, and they will hopefully change in a positive way,” said Franssen. The wise men said they will be fair and neutral in their work, and urged everyone to keep calm. One person who met with the wise men, said he was very upset because their meeting had not been private, as was promised it would be. “To my surprise, I also saw two women at the table. Their role was not introduced, their function not explained. Quite wrong, especially as one of them is the woman the Netherlands wants to force upon us as the new Governor,” the man said on condition of anonymity. The woman in question was Jenny Thunnissen, who is a member of Acting Island Governor Julian Woodley’s support staff. She was added to the Governor’s staff by the Dutch Government. Previously, Statia’s Government stated they were not going to speak with the wise men based on the fact that they had an agreement with Minister Plasterk that the Committee would consist of two persons to be submitted by the Dutch Government, and two by Statia. However, Minister Plasterk did not agree with the two proposed Statia candidates.